Hi girls, how are you today? I hope everyone is doing fine. Today, I would like to share with you about Estee Lauder Advanced Night Repair Synchronized Recovery Complex which I received two weeks ago. I think that it is about time that I share my personal opinion about this serum after using it for 2 weeks. 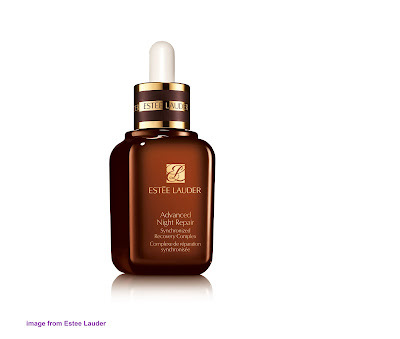 Estee Lauder Advanced Night Repair has a very light texture, therefore it is easily absorbed. Healthy skin cells maximize repair functioning at night through a symphony of precisely timed repair responses based on the body’s natural circadian cycle. The skin cells repair processes are synchronized by a specific family of genes called clock genes. Findings from new research demonstrate that each skin cell contains its own clock genes which help each cell maximize its own DNA repair. However, these clock genes can become out of sync due to ageing and environmental polution. As a result, cellular and DNA repair slows down. Advanced Night Repair Synchronized Recovery Complex has now harnessed the knowledge of clock genes with exclusive Chronolux™ Technology, which supports the natural synchronization of skin’s repair and protective mechanisms. The result is comprehensive skin repair at exactly the right time. Alkylation Damage is caused by smoke and pollution, in particular, toxins and chemicals. If this damage is not repaired quickly enough by a repair enzyme known as Alkyl Guanine Transferase (AGT) found naturally in our skin, the damage becomes permanent. However, as AGT repairs, it gets “used up,” thus needing to be continually replenished. Advanced Night Repair Synchronized Recovery Complex is designed to support skin’s natural repair enzyme to help effectively “clean up” the damaging effects of Alkylation before it becomes permanent. The new formula heightens skin’s natural repair process – critical for its well being. Exclusive Chronolux™ Technology supports the natural synchronization of skin’s repair and protection processes to help skin look younger. Over time, you will see a dramatic reduction in the visible signs of aging, including lines, dehydration and discoloration. When used every night, the new formula helps skin continuously repair the appearance of past damage caused by every major environmental assault – UV light, smoke, pollution, ozone, and even emotional stress – before they become permanent. A proprietary blend of anti-oxidants plus high levels of proven Hyaluronic Acid – nature’s “moisture magnet” – work together to help create the ideal environment for skin’s natural protection and repair. The new formula helps safeguard skin’s future by neutralizing up to 90%* of environmentally-generated free radicals before they can affect skin’s appearance. Apply a few drops of serum evenly onto cleansed skin every night. Follow with moisturizer as needed by your skin type. Advanced Night Repair Synchronized Recovery Complex is Dermatologist-tested, Ophthalmologist-tested, Non-Acnegenic, Fragrance Free, and can be used on All Skin Types. 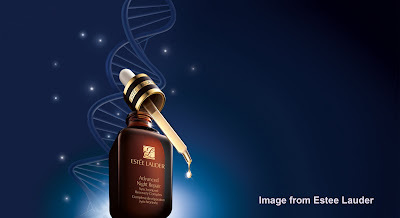 According to Joyce, my Estee Lauder beauty therapist at Isetan (the Gardens), I can use this serum day and night. So, I followed her instruction and use this product faithfully for 2 weeks. I feel that my skin has a healthier glow. I also noticed that the blackheads on my face is easily removed when applying light pressure. 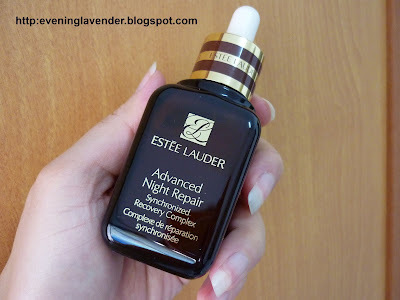 If you asked me what is the one thing that I like most about Estee Lauder Advanced Night Repair? I would say it is the product texture. I like it because it is so light and can absorb almost immediately after application. 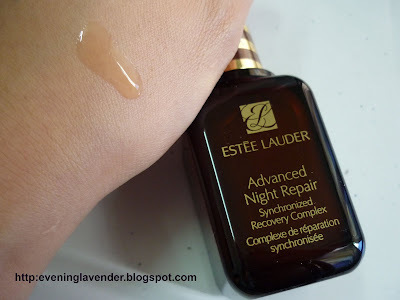 Have you tried this Estee Lauder Advanced Night Repair Synchronized Recovery Complex before? If you have tried this product before, I would love to know your experience using it. Haven't try before but I received one too from Estee Lauder's Pink Walk now stashed in my cupboard waiting to be open n use! it heard this is their star product..many many years din change formula until last year. I have one of this,a miniature, but is it suitable for me bcoz I'm 28?? ya, have to be hardworking. yes this is Estee's star product. Yes u can use it. the earlier u start using the better. yes u should try this star product one day. yes the clock genes thing is also new to me.ya, my friend who has almost finish his first bottle said that he sees his complexion glowing. I have been using this product for veeery long... Before the new one came out, I have been using the brightening version.